15.01.2019: Early in the morning, 514 cars, 78 motorcycles, 22 tractors, 30 bikes, 4 buses have started the journey from the Château de Vincennes esplanade for this winter edition of the Traversée de Paris organized by Vincennes en Anciennes*. Early in the morning, 514 cars, 78 motorcycles, 22 tractors, 30 bikes, 4 buses have started the journey from the Château de Vincennes esplanade for this winter edition of the Traversée de Paris organized by Vincennes en Anciennes*. Effervescence, purr of the engines, friendliness over café and croissant, friends gather and embark in this 19th edition. The 30-kilometer journey passed through the streets and places appearing in comic books: Boulevard de Ménilmontant (Captain America), Gare de l’Est (Nestor Burma), Boulevard Barbès (Jérôme K & Jérôme Bloche), Le Sacré-Coeur (Spirou & Fantasio), Rue Lamarck (Ray Banana), Place de Clichy (Monsieur Jean). Some participants even played some of the comics characters. You could have met iconic characters such as Dupond and Dupont, Captain Haddock… The oldest vehicles Mathis car (1923), Wonder bike (1925), Norton motorcycle (1937), Lanz Bulldog tractor (1950). As usual, the old buses carrying passengers for this unusual journey were full. Around half past noon, some of the vehicles were back on the Château de Vincennes esplanade so that people could admire them and engage with their owners. Some of the tractors have arrived from Toulouse on a plate following the initiative of a young farmer who has succeeded in convincing his peers to “ride to Paris”. He’s organized a fundraiser to rent a truck and a full year has been needed in order to get the old tractors ready for this unique journey. The organization Vincennes en Anciennes saluted the will of this team which confirms the goal of such parade to promote all the rolling heritage. 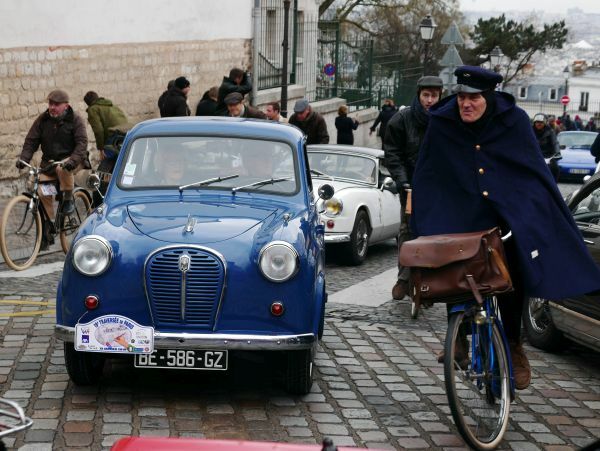 “Once again, the Traversée de Paris has gathered people around the vintage vehicles. Our organization succeeded in glorifying the rolling heritage even though some participants couldn’t join this time due to the protests currently happening in Paris. We will see each other again for the next summer edition that will happen next July 21st “ concludes Jacques d’Andréa, President of the organization Vincennes en Anciennes. * Vincennes en Anciennes is the first French organization of multi-brand vintage cars.